As you have shown so many of my contemporaries with their last rank, could you "bump" me up to my last also (Warrant Officer) - it was nice of you to make me a Corporal in Aden (I was an SAC). Got made Corporal in Sept 1968, posted to Movements at El Adem but due to internal moves ended up in SCAF (what an awful job that was!). In 1977 I was one of those "selected" to get an AOC's Commendation on MAMS base. Will send you the promised photos when I find them - had them - put them down - now missing! The award was truly a case of "Other Beggars Efforts" and it recognised the key work done by the Squadron in the Ethiopian Airlift for famine relief and the contribution UKMAMS made to the Station's preparedness for TACEVAL - which went from fairly dismal to highest praise when His Excellency the Lord Lieutenant of Jersey, Air Chief Marshal Sir John Cheshire, as he now is, was the Station Commander. I set another interesting record - when I was promoted to Group Captain, in 1988, I was the first man who had commanded UKMAMS since its formation in 1966 who was promoted after commanding the Squadron. i.e. all the previous Wing Commanders and Squadron Leaders who were OC never got to Group Captain or Wing Commander respectively. So ... command of UKMAMS was the "kiss of death" for future careers! I am still having trouble transmitting that photo and awaiting daughter to come to my aid. You mentioned in the last OBA that you served in Oman for just under a year and failed to get a GSM for your time there. As you know I was on Gulf MAMS, and later attached to NEAF MAMS in Cyprus and did a couple of stints in Masirah - late fifties, early sixties. As far as I understand, to qualify for the GSM (Dhofar) one only had to serve 30 days in Dhofar (Salalah) or if aircrew, thirty landings and take-off's from Salalah. Sorry you dipped out. On MAMS just now I should think one could notch up at least three rows of gongs. As a matter of interest when I was in the Merchant Navy late 40s early 50s I sailed with a captain who purposely went off course into the territorial waters of Vietnam in order to add to his collection of war medals! A couple of names for you for the RoH page. Could you please update my membership info? Thanks mate and I'll be back to you soon with a 3 page story on the birth and death of RAF Bruggen complied by none other than Sqn Ldr Jerry (I make everything up) Porter. As you can guess it's a bit of a p*ss-take, but makes a good read. Subject: Re: Last three requested. The OBA newsletter is good as ever but too much content from me - I could be slabbed for that as we now say (a slab is a crate of canned beer). Belgium was very expensive but very nice, brought back lots of wine as this was the main reason for the journey. 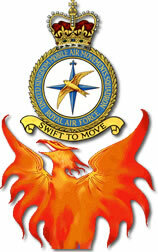 It is a very small world as I ended up sat next to an ex-Airloadmaster I knew who retired 2 years ago. It transpires he is heavily involved in the Boy Entrant's Association and is carrying out a hunt for 45th Entry! Cheers for now and have a good Christmas. Jerry and I worked for 2 years together as DAMOs on C Shift. He's a very funny man, a dry sense of humour, a "closet SAS" chap, has a degree in medicine and has gained the wrath of the hierarchy on many occasions but will still speak his mind. Dirt on him? I have a lot! Sadly Bill passed away in 1993 after a long battle with MS, I attended his funeral in Eastbourne along with Colin Allen. Believe it or not when talking to the vicar afterwards we discovered he was an ex-mover! Until recently Bill's widow Betty subscribed to Team Brief. Back onto the subject of Jubilee Medals. When I arrived in Akrotiri in late 1977 everyone gave me strange looks when they spotted the medal ribbon. On asking why? I was told that in Cyprus only Officers were awarded the medal. It transpires that each unit were given their own option as how to award their quota - obviously in Cyprus the hierarchy looked after themselves! Hazarding a guess, is this Thessaloniki? It's obviously the recovery of an IALCE. The aircraft behind is a C141 Starlifter otherwise known as a "Lizard." The photo is probably taken from within another C141. The item being loaded is a M113 APC (Armoured Personnel Carrier). The guy right side is Bob Thacker and the one on the left looks like Tony Pyne. Circa 1971? Your chance to correct history! Either forward to me your GSM details with clasps and last 3 or send direct to Tony Gale for inclusion on the medal list. 141 Gourdie - GSM with clasp South Arabia. Funny thing - I was looking at the roll of honour and I know for sure that of all those that have the Radfan clasp only two actually served there.Whereby of those who have the South Arabia clasp at least 14 had served in the Radfan. Is that British justice or what? Further, I, along with Tony Searle (I think), were the last MAMS people to leave the Radfan and the air was still full of lead! New on the site this week? I have been busy updating the Roll of Honour page - that particular item seems to have sparked a lot of interest - and I have a lot more names to add from Kosovo, the Former Yugoslavia and Southern Turkey/Northern Iraq. There are two new photographs, the one in Images 2000 is a group shot taken at a medal presentation last year, and the other in Images 1980 is of the War Memorial at Stanley in the Falklands along with a close-up of the RAF participants which includes the Mobile Air Movements Squadron. With the Christmas holidays just around the corner you have only 6 days left to get your greetings into me for publication in the last issue of the Old Boys Briefs for this year (cut-off date is the 21st December). Send to: ukmams_oba@hotmail.com?subject=Season's Greetings!"